When setting a table for a dinner party, cocktail hour, or your next soiree, table linens help set the tone and go a long way toward dressing your dining room. Choosing a table cloth is easy. Below, we've put together the most frequently asked questions we get in our store helping customers select their table linens. What should I look for in a tablecloth? The quality of a tablecloth is a combination of the material, construction, workmanship and design. Most tablecloths are either cotton or linen. These fibers are durable, absorbent, and feel good to the touch. When looking at the construction and workmanship, the seams should be even and straight with no stray strings attached. When evaluating the design, look to see if it is printed or woven damask. If the tablecloth is printed, the printing should be consistent with no large gaps. 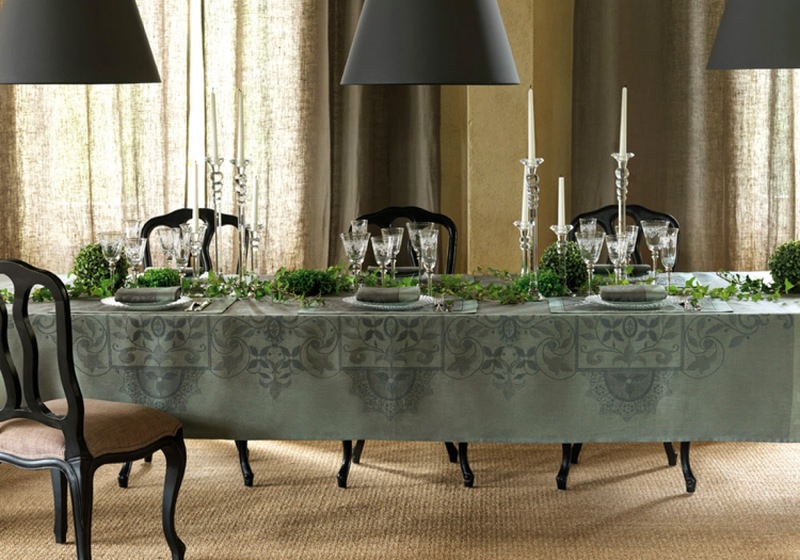 If the tablecloth is woven damask, the weaving should be tight, consistent, and free of flubs. What is the difference between linen and cotton and which should I choose? Both linen and cotton are natural fibers. Both fabrics are absorbent, durable, and become softer with use. Linen fibers are longer than cotton and make table linens feel lighter and smoother. Linen is also highly absorbent and lint free. Cotton fibers are shorter than linen making the table linens feel more substantial. When purchasing tablecloths, linen tablecloths tend to be more expensive than cotton tablecloths and are considered the ultimate choice for formal occasions. What determines the quality of cotton? Cotton quality is based on the length of the fibers and how the thread is spun. Longer fibers can be spun into smoother, stronger and smaller diameter yarns, which can then be woven to create fabric that is softer with more drape. Egyptian cotton is prized because the humid weather and rich soil around the Nile delta produces longer fibers. Egyptian cotton has fibers 2-3 times longer than Pima cotton. What determines the quality of linen? Linen quality is also based on the length of the fibers and how the tread is spun. Higher quality linen fabric is made from longer fibers that produces a finer and stronger yarn with consistent thickness and few slubs. Irish and Belgian linen is considered to be among the finest linen in the world. We recommend that tablecloths have an minimum drop of 10" so that the tablecloths hangs properly on the table. Elaborate occasions may require a drop up to 30" (all the way to the floor). The longer the drop the more dramatic the table setting appears. To calculate the size of the tablecloth you need, measure the length and width of your table and add twice the desired drop to each dimension. For example, if your table measures 42" wide and 84" long and you want a 12" drop, the tablecloth you need should be: 42" + 12" + 12" = 66" wide; 84" + 12" + 12" = 108" long. There are no standard tablecloth sizes among manufacturers. However, most manufacturer will have sizes that are close once you have this calculation. If you want to have an exact fit, you will need to have a custom cloth made. What shape tablecloth do I need? On square or rectangular tables, we suggest a square or rectangular tablecloth. On round tables, either a round or square tablecloth can be used. On oval tables, we recommend a rectangular tablecloth since there is no standard oval table size. My table has several leaves, so what size tablecloth do I need? If your table is extended or shortened often, you will need separate tablecloths fit each size properly. If you budget it limited, we suggest purchasing the tablecloth that will fit the size used most often. Another alternative, is to purchase placemats and napkins instead of multiple tablecloths. What style of tablecloth do I need? This is purely personal preference. In Downtown Abbey style, white linen damask tablecloths were the fashion. Today however, this preconceived etiquette is not as defined. Today, colored tablecloths are just as fashionable as white linen damask. We recommend purchasing what you like, what works with the theme or tone of your event, and what works with your dinnerware. Table linens are an investment that is meant to be used. You will use them more if you love them. How do I care for my table linens? Cotton and linen table linens can be laundered at home. They should be washed in cool water using regular detergent; we do not recommend detergents with bleaching agents as these can weaken the fibers. Most table linens can be dried in the dryer, but should be removed while slightly damp in order to minimize wrinkles. We also do not recommend fabric softener or dryer sheets. These leave a waxy surface on the fiber which can hold stains permanently. If you do get stains, treat them as soon as possible to completely remove the stain. For ease of ironing, iron on the reverse side while still slightly damp. Starch is not necessary, but will make a crisper tablecloth. How do I store my table linens? Store table linens clean and dry. Avoid starching them prior to storage; starch is a food source for bugs that then create holes in the table linens. Starch also yellows as it ages. Fold table linens gently and store them in a cool, dry, and well ventilated place. Do not store table linens in plastic bags, basements, attics or garages to prevent large fluctuations in humidity and temperature which can cause deterioration of the fibers. Searching for table linens? See our recommended table linens collection.